For the PM update, we updated the top spot to read, "Clinton to Monica: I'm Sorry," though the statement was delivered by his lawyers: "On behalf of the president, we would like to tell you that we are all very sorry for what you've been through." We also see a few design tweaks below the top promo block; first, we left-aligned the dynamic My News headline (and changed it from "Top News Now" to "My News" with a mini-icon) in preparation for doubling the number of news headlines. 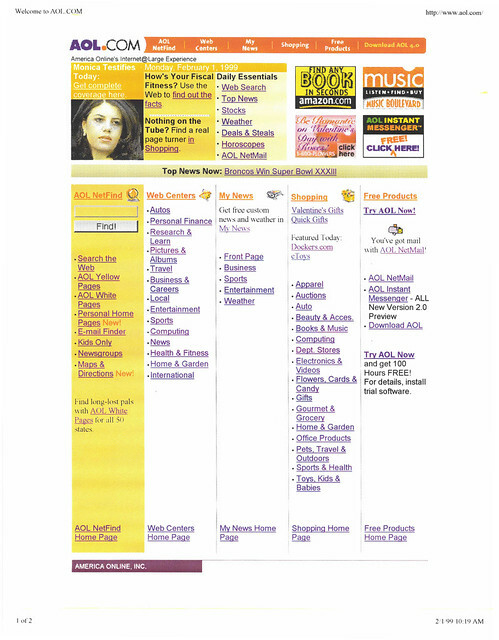 Then, we moved the AOL NetFind Search box from the left column and extended it and its yellow bar across the entire page. 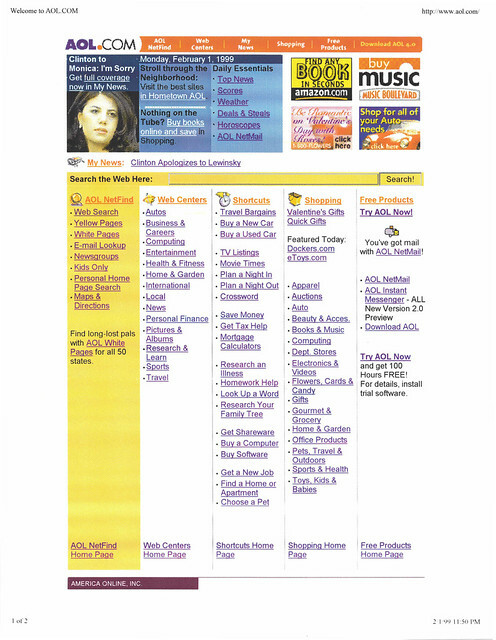 We also took the center column, formerly the My News categories, and turned it into a Shortcuts column, featuring a mish-mosh of links in semi-logical groupings -- everything from travel bargains and car shopping, to TV listings and crosswords, to personal finance, research topics, shareware and computer shopping, and job listings, real estate listings, and... pet finder?